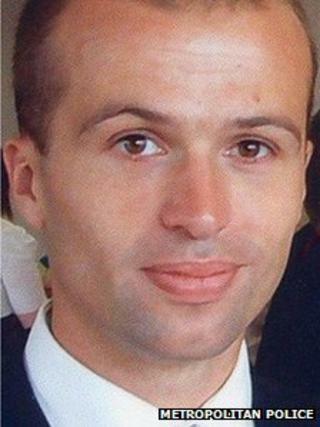 The death of MI6 spy Gareth Williams, whose body was found in a padlocked sports bag, was probably an accident, police have said. But the Metropolitan Police said an evidence review had found "it was more probable" no other person was present when he died in his London flat. Mr Williams's family said they stood by the coroner's findings. In a statement, they said: "We are naturally disappointed that it is still not possible to state with certainty how Gareth died and the fact that the circumstances of his death are still unknown adds to our grief. "We consider that on the basis of the facts at present known, the coroner's verdict accurately reflects the circumstances of Gareth's death." Mr Williams's body was found naked at his flat in Pimlico on 23 August 2010 after colleagues raised concerns for his welfare. He had been on a secondment with MI6 from his job as a communications officer at the GCHQ "listening post" in Cheltenham, Gloucestershire. Police discovered his body inside a zipped-up red sports holdall, in the empty bath of his bathroom. It had taken a week for MI6 to investigate the code-breaker's disappearance, and a post-mortem examination carried out by a Home Office pathologist failed to determine the cause of death. Scotland Yard's conclusion is not only different to that of the coroner - but also to that of Detective Chief Inspector Jackie Sebire, who led the original inquiry. After the inquest she said it was "highly likely" a third party was involved in Gareth Williams's death. So what has changed? There doesn't appear to have been any stunning revelation or startling piece of new evidence. What has happened is that a re-evaluation of the material and fresh interviews with the MI6 officer's colleagues have led detectives to make different "inferences" from those made before. The police's new findings are likely to fuel theories of a successful cover up by the intelligence agencies - but DAC Hewitt said it was "beyond credibility" that he, as an experienced investigator, had had the wool pulled over his eyes. During a seven-day inquest in May 2012, the question of whether Mr Williams could have padlocked himself into a bag in a bath was central. Coroner Fiona Wilcox concluded that "most of the fundamental questions in relation to how Gareth died remain unanswered". But she said he was, "on the balance of probabilities", unlawfully killed. At a briefing on Wednesday, the Met Police announced the conclusion of its three-year investigation into the incident. Deputy Assistant Commissioner Martin Hewitt said he was satisfied it was "theoretically possible" Mr Williams could have padlocked the bag from the inside, although "many questions remain unanswered" as to the circumstances of his death. But he said there was no evidence that the MI6 officer had intended to take his own life or that his death was connected to his work. And he insisted it was "beyond credibility" that he had been misled. "I do not believe that I have had the wool pulled over my eyes. I believe that what we are dealing with is a tragic unexplained death," he said. DAC Hewitt also said there was no evidence that Mr Williams' flat had been forensically cleaned, adding it was a "fallacy" that it had been deep-cleaned in such a way that only certain DNA was left in the premises. He acknowledged that the coroner, having studied "all the evidence available at that stage" had made "the logical inference that it was more likely someone else was involved in Gareth's death". "However, she also recognised that there has been endless speculation but little real evidence and it was her view [that] 'it is unlikely that his death will ever be satisfactorily explained'," he said. "Now at the end of our investigation, based on the evidence, or where we have been unable to find positive evidence, we believe that it is a more probable conclusion that there was no other person present when Gareth died. "But the reality is that for both hypotheses, there exist evidential contradictions and gaps in our understanding."